Isoflurane, Hippocampal area, Gene expression, SD rat. At present, general anesthesia has been widely applied in neural science basic research and many clinical medical operations. With the temporary coma, different changes are unavoidably appearing in the physiological metabolism and neurochemical process during general anesthesia, they may appear in electrical activity of the brain, hemodynamics, energy metabolism, nerve conduction, neuronal signaling pathway, related gene protein expression and etc. [1-3]. Now some studies have confirmed that general anesthesia will impact on memory of patients, even cause persistent learning disability, which may influence the nerve regeneration in hippocampus and increase the content of brain β amyloid protein. So the main complications are commonly found in central nervous system. It was widely discussed that the effect of general anesthesia on brain gene and protein expression by many researches, but the duration of molecular alterations and anesthesia, the degree of molecular change during anesthesia induction are still clear [4,5]. In this study, isoflurane was applied in the rapid induction of anesthesia to test the expression of hippocampus associated genes. This study was carried out in accordance with the recommendations of 'the Guide for the Care and Use of Laboratory Animals of Xi'an Jiaotong University'. The protocol was approved by the 'Ethic Committee of Xi'an Jiaotong University'. Chose thirty 10-week old male SD rats, which were bought from Beijing Weitong Lihua Experimental Animal Technology Co. Ltd. All the rats were raised with standard animal feeding conditions, 20 of them were anaesthetized by isoflurane for 30 minutes, 10 rats without anaesthetizing were employed as control. For the anaesthesia group, oxygen (rate of flow was 21 L/min) was regarded as the carrier when applying isoflurane (Baxter, Deerfield, IL. USA). We put the rats in a closed container, one end was connected with a sprayer, during the anesthesia induction stage, the concentration of isoflurane was 4%, the rats entered into deep anesthesia stage after 3 minutes and reset the concentration to 2%. Then we closed the anesthetic gas flow after 30 minutes and waited for 3 minutes, all the rats could return to normal, then the rats were put in 35°C to observe for 2 h. All the operations were almost the same for control group, applied the same equipment but only adopted oxygen to get through the confined space for 30 minutes. Executed half number of the two groups respectively on the first and third day after anaesthesia, then extracted hippocampal tissues and put them in low temperature phosphate buffer saline. Add 1 ml Qiazol (Qiagen, Hilden, Germany) and 5 mm stainless steel shot in the specimen and shook them for 2 × 5 min (Qiagen) for materialization in the condition of 25 Hz. After that, applied RNeasy lipid tissue kit to extract total the concentration of RNA, RNA by NanoDrop 1000 Spectrophotometer (Thermo Scientific, DE, USA) according to product instructions. All the operation in this study were agreed and admitted by ethics committee of our hospital. Applied iScript cDNA Synthetic box (Bio-Rad Laboratories, Hercules, USA) to Obtain cDNA according to product instructions, it was the mixture of random primer and oligo (dT) primer, the content of reactant was 20 μl during reverse transcription. 1ug total RNA was applied in each cDNA reaction and used non-targeted experimental water to dilute the concentration to 10 ng/μl. The related PCR analyses were processed by Primer 3 (http://frodo.wi.mit.edu/) and NetPrimer (Premier Biosoft, Palo Alto, USA) and related products were analyzed by 1.5% agarose gel electrophoresis and solubility curve; real-time PCR analysis were analyzed by LightCycler 480 (RocheDiagnostics, Basel, Switzerland). The specific parameter settings were 95°C 3 minutes, 95°C for 20 s, 60°C for 20 s, 72°C for 20 s, which included 45 circulations. The content of reagent was 10ul, which included iQ SYBR Green Supermix (Bio-Rad), 0.4 μM forward and reverse primers (Eurofins MWG Operon, Ebersberg, Germany) and 2 μl cDNA masterplate. Reference genes were evaluated by Reference Gene Panel Mouse (TATAA Biocenter, Sweden) and NormFinder; phosphoglyceric kinase (PGK1), glyceraldehyde-3-phosphate dehydrogenase (GAPDH) and total RNA were applied in standard mRNA expression. All the data were summarized and analyzed by PASW Statistics 20 (IBM Corporation) software, the data were recorded as average value ± standard deviation. Postmortem analysis was processed after single variable analysis (Dunnett t test, which compared with control group). If P<0.05, then the difference had statistical significance. We found three genes were upregulated in the first day, one gene were upregulated in the third day, two genes upregulated on both of the two time points and other 12 genes did not show significantly change in this two time points (Figure 1). Figure 1. 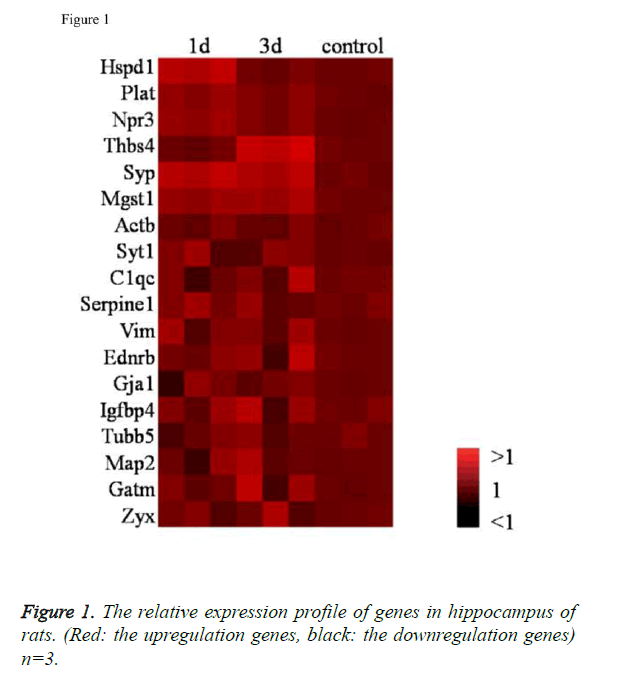 The relative expression profile of genes in hippocampus of rats. (Red: the upregulation genes, black: the downregulation genes) n=3. The expression level of Heat shock protein d1 (Hspd1) increased obviously after using isoflurane anesthesia for 1 day (Fold Δ=1.61; Figure 2A, P<0.05), which decreased in the third day and compared with control group, there was no obvious difference. Npr3 encoded natriuretic peptide receptor 3 could regulate smooth muscle relaxation of blood-vascular system. Plat main encoding tissue plasminogen activator was regarded as one of the essential factors which could clean intravascalar agglutination. In this research, the expression level of these two genes was obviously higher than that of control group after isoflurane anesthesia (Figures 2B and 2C). But the expression level showed nothing different at two time points: the first and third day. Figure 2. The relative expression levels for Hspd1, Plat, Npr3 in the first and third day after short-term isoflurane anesthesia, P<0.05. Thbs4 major encoded thrombin 4, which was usually expressed in star keratinocyte and after tissue damages. The study showed that thrombin sensitive protein 4 was able to promote star keratinocyte regeneration and tissue cell protection function after brain injury. At the same time, it related to presynaptic hypersensitiveness and neurite growth. This gene expression showed nothing different for 1 day after isoflurane anesthesia, but it increased significantly after 3 days (Fold Δ =1.83; P<0.01). Synaptophysin Syp, which was the Synaptic vesicle glycoprotein and it existed in almost all the neurons. It was always used as the marker of synaptic remodeling. The expressions of Syp increased obviously in the first (Fold Δ=1.72; Figure 3A, P<0.01) and third day (Fold Δ=1.47; Figure 3B, P<0.05) after using anaesthetic. Mgst1 major encoded microsomal glutathione S-transferase 1, which was the neuronal cytoplasmic enzyme. It related to detoxification of parent substances, at the same time, it was regarded to process the protection for neuronal cells, which could avoid to be disturbed by the metabolic products of endogenous and exogenous neurotoxicity. There was no obvious change for its expression after using isoflurane anesthesia for 1 day, but the expression increased obviously after 3 days (Fold Δ=1.36; Figure 4, P<0.05). Figure 3. The relative expression level for Thbs4 in the first and third day after short-term isoflurane anesthesia, P<0.05. Figure 4. The relative expression levels for Syp and Mgst1 in the first and third day after short-term isoflurane anesthesia, P<0.05. Compared with the control group, there was no obvious different expression for the other 12 genes, including Syt1, C1qc, Serpine1, Vim, Ednrb, Gja1, Igfbp4, Tubb, Map2, Gatm and Zyx, among the 1 day after anesthesia, 3 days after anesthesia and control group (average difference<20%; P>0.05). At present, the number of research report about the effects of isoflurane anesthesia on expression of brain tissue gene is still small. In this study, it was the first time for us to confirm that a short time of isoflurane anesthesia could produce an effect on gene expression in hippocampus, which could last for some days. While some researches stressed that the effect on gene expression could only last for 2-4 hours, if the corresponding anesthesia duration was extended, then the effect might be more obvious and the duration might be longer with it. In many genes that were included in the analysis, Hspd1 showed obvious increasing expression in the early stage of anesthesia (1 day), which corresponds to its function of the stress protein. At the same time, it was the same with previous report, which confirmed that it could produce obvious stress effect on tissue cells from other side [6-8], its expression level was still increasing 3 hours after using isoflurane anesthesia. The expression of Plat gene (tissue plasminogen activator) only increased in the first day after anaesthesia, which mentioned that it played a certain role in early cell stress, stopping bleeding and fibrinolysis. The reports showed that except for cardiovascular system, tissue plasminogen activator also played an important role in central nervous system, such as reconsitution and plasticity of synapse. Animal experiments have confirmed that the release of this factor in ischemia and inflammatory reaction could promote neuronal apoptosis in the brain . The expression of Mgst1 (Microsomal glutathione S-transferase 1) was different from that of Hspd1 and Plat, it could only increase obviously in the third day after isoflurane anesthesia. This gene could be found in nerve and non-nerve tissue cells, and its expression would increase with the increasing of age . Glutathione S-transferase could resist exogenous or endogenous neurotoxicity metabolites, which mentioned that Mgst1 may process the function of protecting cerebrum nerve cell and controlling the toxic substances produced by anesthesia on nerve cells. It should be noted that in this study we confirmed that the effective duration caused by general anesthesia was longer than that of previous reports [11-13]. The expressions of Syp and Thbs4 in rat hippocampus all increased after 3 days of isoflurane anesthesia. Thbs4 encoding thrombin sensitive protein 4, which mainly expressed in astrocyte. Its expression always increased after body damage and thrombin sensitive protein 4 mainly located in the joint of synapses and neuromuscular, which adjusted the growth of synapses. Syp mainly coded synaptophysin, which was synaptic follicular glycoprotein. They existed in all the nerve cells of central nervous system, which played a certain regulatory role for synaptic vesicle endocytosis [14-17]. A recent research showed that Beta amyloid protein in neurons of the hippocampus was regarded as regulation factor of neurotransmitter release, which could promote the vesica endocytosis by interfering interreaction between synaptophysin and vesicle associated membrane protein 2 (VAMP2). The usage of isoflurane anesthesia also mentioned that it processed the effect of beta amyloid accumulation in vivo. Therefore, it was also possible to produce Syp compensatory expression after synaptophysin beta amyloid protein interference and the compound of VAMP2 by using isoflurane anesthesia. Syt1 was responsible for coding the proteins in the presynaptic membrane, its expression was not influenced by anaesthesia in this study. So the increasing expression of Syp4 could not show that isoflurane anesthesia could have an effect on the whole synaptic structure in hippocampus of rats. There was np obvious change for Plat and Npr3 in the two detection time points after isoflurane anesthesia. Npr3 coded natriuretic peptide receptor 3, which regulated smooth muscle relaxation in blood-vascular system. So we could deduce that general anesthesia drugs might have a certain effect on cerebrovascular system. It was necessary to explore the effect of long and short anaesthetic on cerebrovascular system [18,19]. The main limitation of this study was the limited number of genes, which meant the related representation might be poor. But the study result could basically confirm selective gene expression analysis could be used for quantitative proteomics analysis and gene sequencing. The existing research reports only showed that the expression of HSP60 in hippocampus tissue increased in 3 hours after isoflurane anesthesia, but at present, there is still no literature report for other related gene expression changes. The aim of this study is that now isoflurane anesthesia has been widely applied in the operations for adults and children, and recently, some studies shows that isoflurane anesthesia could produce constant, progressive memory impairment and the loss of neural stem cells [20-23]. There is no evidence that can indicate their relationship, but the cohort study based on population showed that the incidence of learning disabilities for the adults was higher if the patients received anaesthesia before 4 years old. So the brain of the minor is more sensitive to the negative effect of anesthesia. Our study indicated that isoflurane anesthesia for 30 minutes could increase mRNA expression of heat shock protein 1 in rat hippocampus, which mentioned that stress existed in this brain position and might relate to late memory and learning ability. This effect lasted more than 1 day after surgery. In addition, Mgst1 processed the function of neural metabolic protection. There was no obvious reaction in 1 day after anesthesia, but the expression increased obviously in 3 days after anesthesia. So a certain delay existed in the negative effect that was produced by isoflurane anesthesia. Therefore, it had a certain significance for this delay effect. Combined the adverse effects of general anesthesia with the conclusion of this study, it is unable to consider that the effect of short-term isoflurane anesthesia could be eliminated in 1 hour. It is still necessary to be cautious and careful subsequent effect of short-term and long-term anaesthesia on patients. 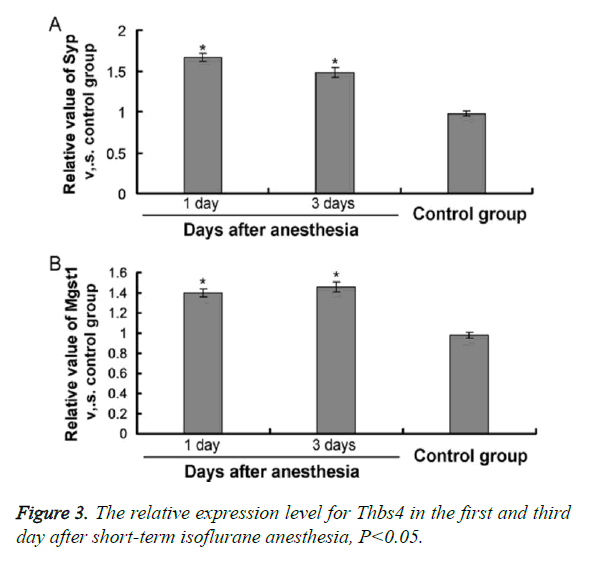 In this study, we mainly confirmed that the application of isoflurane for a short time could change the related expression in rat hippocampus and the related influence could last for 3 days after the end of anesthesia. This work was supported by National Science Foundation of China (30900800), Science and Technology Program of Shaan- Xi Province, and the Fundamental Research Funds for the Central Universities. Luo TS, Tao GC, Yi B. The influence of cognitive function on operation under isoflurane anesthesia in aged rats after operation. Chinese J Anesthesiol 2009; 29: 1102-1105. Zhu C, Gao J, Karlsson N, Li Q, Zhang Y, Huang Z, Li H, Kuhn HG, Blomgren K. Isoflurane anesthesia induced persistent, progressive memory impairment, caused a loss of neural stem cells, and reduced neurogenesis in young, but not adult, rodents. J Cereb Blood Flow Metab 2010; 30: 1017-1030. Xie Z, Culley DJ, Dong Y, Zhang G, Zhang B, Moir RD, Frosch MP, Crosby G, Tanzi RE. The common inhalation anesthetic isoflurane induces caspase activation and increases amyloid beta-protein level in vivo. Ann Neurol 2008; 64: 618-627. Culley DJ, Yukhananov RY, Xie Z, Gali RR, Tanzi RE, Crosby G. Altered hippocampal gene expression 2 days after general anesthesia in rats. Eur J Pharmacol 2006; 549: 71-78. Futterer CD, Maurer MH, Schmitt A, Feldmann RE Jr, Kuschinsky W, Waschke KF. Alterations in rat brain proteins after desflurane anesthesia. Anesthesiology 2004; 100: 302-308. Kalenka A, Gross B, Maurer MH, Thierse HJ, Feldmann RE Jr. Isoflurane anesthesia elicits protein pattern changes in rat hippocampus. J Neurosurg Anesthesiol 2010; 22: 144-154. Pan Z, Lu XF, Shao C, Zhang C, Yang J, Ma T, Zhang LC, Cao JL. The effects of sevoflurane anesthesia on rat hippocampus: a genomic expression analysis. Brain Res 2011; 1381: 124-133. Rampil IJ, Moller DH, Bell AH. Isoflurane modulates genomic expression in rat amygdala. Anesth Analg 2006; 102: 1431-1438. Buga AM, Sascau M, Pisoschi C, Herndon JG, Kessler C, Popa-Wagner A. The genomic response of the ipsilateral and contralateral cortex to stroke in aged rats. J Cell Mol Med 2008; 12: 2731-2753. Hori M, Nakamachi T, Rakwal R, Shibato J, Nakamura K, Wada Y, Tsuchikawa D, Yoshikawa A, Tamaki K, Shioda S. Unraveling the ischemic brain transcriptome in a permanent middle cerebral artery occlusion mouse model by DNA microarray analysis. Dis Model Mech 2012; 5: 270-283. Zhang J, Ou YW. Effects of isoflurane on neuronal apoptosis in aged rats. Chinese J Anesthesiol 2009; 7: 610-612. Potokar M, Kreft M, Li L, Daniel Andersson J, Pangrsic T, Chowdhury HH, Pekny M, Zorec R. Cytoskeleton and vesicle mobility in astrocytes. Traffic 2007; 8: 12-20. Andersen CL, Jensen JL, Orntoft TF. Normalization of real-time quantitative reverse transcription-PCR data: a model-based variance estimation approach to identify genes suited for normalization, applied to bladder and colon cancer data sets. Cancer Res 2004; 64: 5245-5250. Ståhlberg A, Zoric N, Aman P, Kubista M. Quantitative real-time PCR for cancer detection: the lymphoma case. Expert Rev Mol Diagn 2005; 5: 221-230. Kim DS, Li KW, Boroujerdi A, Peter Yu Y, Zhou CY, Deng P, Park J, Zhang X, Lee J, Corpe M, Sharp K, Steward O, Eroglu C, Barres B, Zaucke F, Xu ZC, Luo ZD. Thrombospondin-4 contributes to spinal sensitization and neuropathic pain states. J Neurosci 2012; 32: 8977-8987. Benchenane K, Lopez-Atalaya JP, Fernandez-Monreal M, Touzani O, Vivien D. Equivocal roles of tissue-type plasogen activator in stroke-induced injury. Trends Neurosci 2004; 27: 155-160. Calabresi P, Napolitano M, Centonze D, Marfia GA, Gubellini P, Teule MA, Berretta N, Bernardi G, Frati L, Tolu M, Gulino A. Tissue plasminogen activator controls multiple forms of synaptic plasticity and memory. Eur J Neurosci 2000; 12: 1002-1012. McGinn MJ, Colello RJ, Sun D. Age-related proteomic changes in the subventricular zone and their association with neural stem/progenitor cell proliferation. J Neurosci Res 2012; 90: 1159-1168. Dunkle ET, Zaucke F, Clegg DO. Thrombospondin-4 and matrix three-dimensionality in axon outgrowth and adhesion in the developing retina. Exp Eye Res 2007; 84: 707-717. Wilder RT, Flick RP, Sprung J, Katusic SK, Barbaresi WJ, Mickelson C, Gleich SJ, Schroeder DR, Weaver AL, Warner DO. Early exposure to anesthesia and learning disabilities in a population-based birth cohort. Anesthesiology 2009; 110: 796-804. Mandal PK, Schifilliti D, Mafrica F, Fodale V. Inhaled anesthesia and cognitive performance. Drugs Today (Barc) 2009; 45: 47-54. Culley DJ, Baxter M, Yukhananov R, Crosby G. The memory effects of general anesthesia persist for weeks in young and aged rats. Anesth Analg 2003; 96: 1004-1009.